By the early 1960s, the Electro-Motive Division (EMD) was at a big disadvantage. The 567 engine, in use for over twenty years, had reached it's peak at 2,500 horsepower in a turbocharged 16 cylinder version. EMD replaced it with the new 645 engine in 1966. The most powerful locomotive of the 645 line was the SD45. Powered by a 20 cylinder turbocharged 645E engine, the SD45 produced 3600 horsepower. Orders from railroads all over the country, especially the western ones, poured in. Great Northern received the first one off the production line and Santa Fe took delivery of a 90 unit order the first year. At the same time, Santa Fe was looking to replace an aging fleet of passenger locomotives. Santa Fe wanted something more stylish than a freight hood unit with a steam generator for the Super Chief. EMD had already extended the SD45 frame and added a steam generator to the rear creating the SDP45. They responded to Santa Fe's request be adding a cowl body to the SDP45, creating the FP45. Santa Fe took delivery of the first nine FP45s in December 1967. Numbered 100 to108, they were painted in the red and silver warbonnet passenger scheme with black roman-style Santa Fe on the sides. This gave Santa Fe what they wanted: A new, reliable, and powerful locomotive that had a streamlined look to pull the "Super Chief". The cowl also offered a cleaner engine compartment and internal walkways, both of which would lead to production of the F45, a regular SD45 with the cowl. Santa Fe acquired 40 F45s in 1968, numbered 1900 to 1939, delivered in the blue and yellow "pinstripe" paint scheme. The second twenty were equipped with steam lines for use on passenger trains. 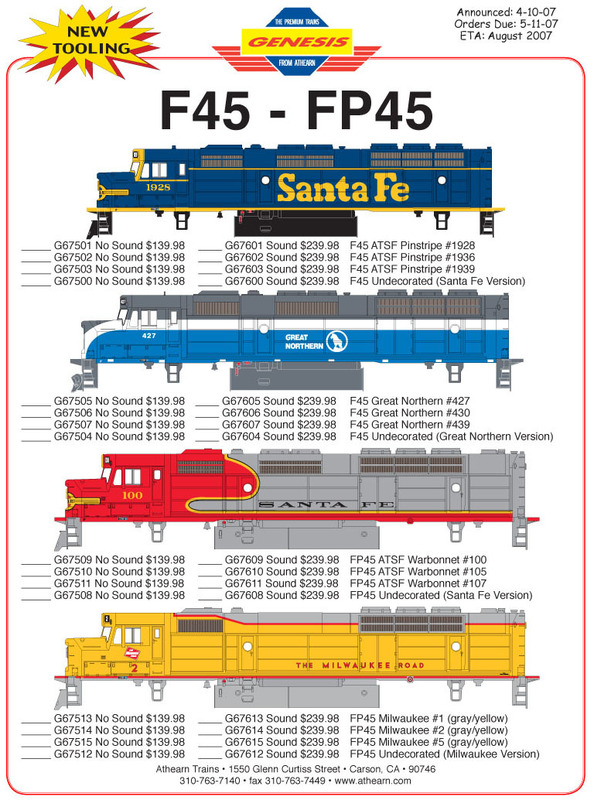 When Amtrak took over passenger service, the FP45s went into the freight pool and received blue and yellow paint. The pinstripe paint scheme gave way to a blue and yellow warbonnet scheme by 1980. In the early 1980s, all 40 F45s and eight FP45s were rebuilt at the San Bernardino shops. During the failed merger with Southern Pacific, seven FP45s and twenty F45s received the red and yellow "Kodachrome" paint. On July 4, 1989, FP45s 5992 and 5998 were released from the San Bernardino shops as numbers 101 and 102 in the newly revived red and silver warbonnet "Super Fleet" scheme with a large Santa Fe on the sides. Two FP45s were wrecked and scrapped and one was sold to Wisconsin Central, while the remaining six were donated to various railroad museums. Six F45s were also sold to WC and the remaining units went to Morrison-Knudsen as lease units with one being assigned and painted for the Utah Railway. Milwaukee Road was the other railroad that bought FP45s. Arriving in late 1968 for Hiawatha passenger service, they wore the UP yellow and gray scheme, and were numbered 1 to 5. They differed from the other F45s and FP45s built as they did not have dynamic brakes. Even before Amtrak, they were re-assigned to freight service between Chicago and the Twin Cities. Great Northern acquired 14 F45s, numbered 427 to 440, painted in the Big Sky Blue scheme, in 1969. The internal walkways were very important to the GN given the winter weather on the line between the Twin Cities and Seattle. Crews no longer had to worry about ice and snow covered walkways on the units. GN planned to run all of their main-line freights with a F45 on the point. GN ordered an additional twelve units, which were delivered in 1970 as Burlington Northern 6614 to 6625. BN continued the F45 purchase in 1971, buying 20 more units, numbered 6626 to 6645. The 46 F45s were regular power on Chicago to the West Coast trains over the former GN lines. Three of the original GN units were leased to Utah Railway for five years after being retired by BN. Two other units were sold to Susquehanna and three others went first to Trancisco, then to Wisconsin and Southern, and finally to Montana Rail Link. One of the two Susquehanna units was re-sold to MRL in 1993.